Why Do People Travel From ALL DISTANCES To Buy From Ross Chrysler Jeep Dodge Ram? You will Save Time, Money and enjoy an amazing experience while shopping with us! Here are just a few more reasons why! Time is money and we will save you both! Chrysler Jeep Dodge an Ram Certified! Along with Ram Experts and Uconnect Experts available on site! There are so many perks for our customers, ASK ABOUT THE ROSS DIFFERENCE and JOIN THE ADVANTAGE TODAY - Along with your purchase get - COMPLIMENTARY CAR WASHES, Nitrogen filled tires, free oil changes, comfortable waiting area with free Wi-Fi and more just with your purchase! Listen to our customers and hear what they have to say about us by checking out our testimonials page! We at Ross Chrysler Jeep Dodge Ram have a long standing reputation as being one of the best dealerships in North Carolina and even more so within the High Country. Most of our staff has been employed at our dealership for numerous years. We offer a low pressure approach with aggressive pricing. If you are in the market for a new or pre-owned vehicle you can rest assured knowing Ross Chrysler Jeep Dodge Ram is the place for you to do business! Not in the mood to travel to Boone, NC to get your New or Pre-Owned Vehicle but still want the Ross Difference? - No, Problem!!! 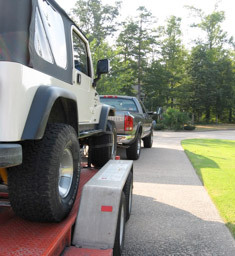 Our In House-Shipper Delivers Your Vehicle directly to your door. Provide us your Zip Code and we'll provide you a super fast quote. Click Here For A Shipping Quote! Reliable Smooth Transactions that we've been doing for years and years! Let's start at the beginning with a family owned and operated dealer who cares about their customers and overall satisfaction. Want to join the Ross Difference?